Forgotten by the media who never fail to find fault with what Israel does. Note: this was sent to Arutz Sheva by a non-Jewish American reader. Responses to issues about which Arutz Sheva has asked readers to express their opinions. Guess the media and the government forgot to mention that? Just another reason we need to END foreign aid to most countries that we currently give BILLIONS to while we pile up the debt and pass it along to our children. We think it is highly appropriate at this time of the year that we send THANKS to all of the countries that have reciprocated for our help with their disasters, misgivings, social turmoil and poverty by returning the favor.....by sending the United States of America monetary and physical help when Sandy ravaged our East Coast leaving death, homelessness, destruction and pure disaster. Listed below are the names of the countries and worldwide organizations that gave us gracious assistance. Please help me in thanking these entities by passing on this email so people from all over America can join in and THANK our friends and neighbors.....to whom we have given BILLIONS! Israel Flying Aid, the Israeli global humanitarian organization which was first to land in Haiti following the 2010 earthquake, has been distributing large supplies of gas to hospitals, food, batteries and generators to Hurricane Sandy victims. "We have many years of disaster relief experience," said Israel Flying Aid North American Operations Manager Moti Kahana. "Israel Flying Aid, in having Israelis on the ground here in New York and New Jersey, have made Israel the only foreign nation to provide humanitarian assistance to the US during this disaster. We are working in coordination with FEMA, local police, the American Red Cross and Jewish communities in New York, New Jersey and Connecticut." Kahana said that most of the efforts had been donated by Israelis living in the US and this enabled gas to be distributed to hospitals in New York and New Jersey. Israel Flying Aid is one of several Israeli organizations that operate under IsraAid. Since its creation in 2001, IsraAID has coordinated and facilitated aid programs all over the world, notably: relief to cyclone victims in Myanmar, long term aid programs for starving communities in Malawi, rehabilitation and relief in South East Asia following the devastating tsunami, psycho-social programs for Darfur refugees on the Chad-Sudan border, and aid to Somali war refugees in Kenya, as well as many more. Joel Leyden, who served as an Israel Flying Aid Operations and Communications Specialist with the IFA in Haiti, has been working with several US governmental, Jewish and Israeli organizations including the Greater Hartford Jewish Community to distribute both food and generators on Long Island. "We had a convoy of food and generators move out of the Greater Hartford area early yesterday morning," said Leyden. 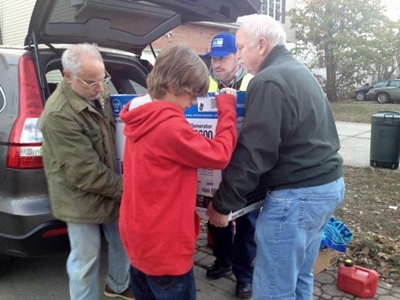 emergency food convoy for first responders and Hurricane Sandy victims in New York. 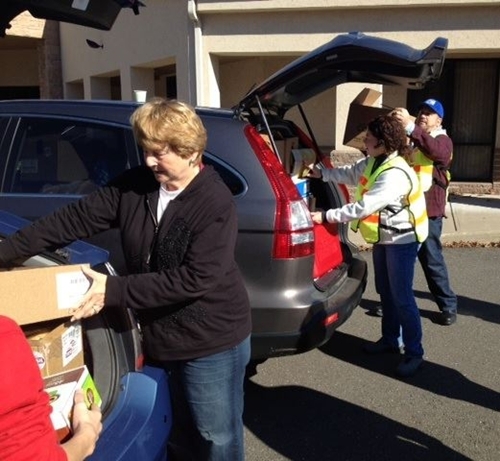 "The food had been donated by Panera Bread and Dunkin Donuts in the Hartford, Manchester Connecticut area. This food was distributed to hurricane victims on the south shore of Long Island, the Nassau County Police, the Freeport Fire Department and the Red Cross Shelter which is set up at Nassau Community College." "We are so very proud to see you, to welcome you to New York," said Dr. Jason Mallin, who normally practices neurology at North Shore University Hospital but was now volunteering with the Nassau County Department of Health. "We read about Israel and the great work you did in Haiti. We have thousands here that need you. It's awesome that you are here!" "We had some bad press as a result of misunderstandings," said Duarte. People in Staten Island, New York were looking for us but due to a New York State law, we could not start operations until after three days. We are now operating at full capacity throughout New York City and this Red Cross shelter at Nassau Community College with over 900 clients. These people have lost their homes. Lost everything. We are here for them and so very pleased to receive your good help." Duarte, who hadn't slept in three days, had coordinated a first class shelter and his staff could not have been more professional. Sleeping cots, Red Cross blankets, a cafeteria and even a play area for children had been carefully put into place. The fresh food from Israel Flying Aid was served as part of the dinner that evening. "As Israelis, we know how to react to such disasters," said Kahana. "We are trained in the military to be prepared and ready at a moment's notice. This edge is what enables us to go places where others don't and get the job done with little or no bureaucracy. We are proud to help the New York, New Jersey and Connecticut communities, people who have provided assistance to Israel throughout the years..."
So there it is, Arutz Sheva readers. At least you know.